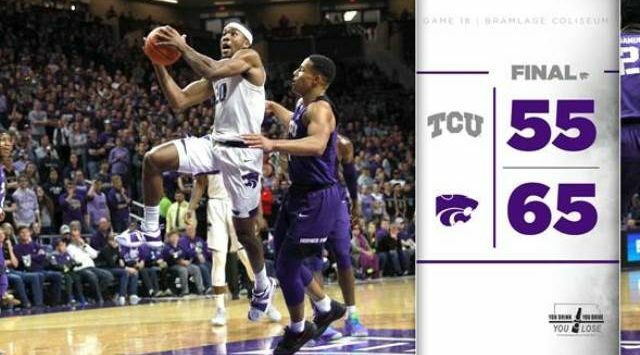 MANHATTAN, Kan. – Kansas State extended its win streak to four games by holding TCU to a season-low 55 points, as the Wildcats led wire-to-wire in downing the Horned Frogs, 65-55, in front of 9,809 fans at Bramlage Coliseum on Saturday. K-State (14-4, 4-2 Big 12) held the Big 12’s top scoring offense (80.4 ppg.) to 55 points on 42.6 percent (20-of-47) shooting, as the Wildcats have now held 11 of their 18 opponents to 60 points or less this season. The school has now held 80 opponents to 60 points or less under head coach Bruce Weber, where the team boasts a 72-8 mark. Junior Xavier Sneed paced three Wildcats in double figures with a season-high 18 points on 6-of-9 shooting from the field and 5-of-6 from the free throw line. Senior Dean Wade scored 16 points on 4-of-9 field goals and 8-of-9 free throws go with a game-high 6 assists, while fellow senior Barry Brown, Jr., added 10 points and a game-high 5 rebounds. Senior Kamau Stokes and junior Makol Mawien each chipped in 8 points. TCU (13-4, 2-3 Big 12) was held to more than 25 points under its scoring average and eclipsed its previous season- low for points of 64 against Lipscomb on November 20, 2018. The Wildcats forced the Horned Frogs into 18 turnovers, their second-most turnovers this season, which resulted in 21 points. K-State has now scored 20 or more points on opponent miscues in 7 games this season. Senior Alex Robinson led three Horned Frogs in double figures with 17 points on 6-of-11 field goals with 4 assists and 2 steals, while junior Desmond Bane and senior J.D. Miller added 16 and 11 points, respectively. The win extends K-State’s lead in the all-time series to 14-6, as the Wildcats have now won four of their last five against the Horned Frogs. K-State also extends its record against TCU at home to 8-2. The Wildcats wasted no time in jumping out to the early lead, as K-State forced turnovers on TCU’s first 3 possessions, putting the offense in a position to gain the early lead. Senior Kamau Stokes took advantage of the situation, knocking down two early 3-pointers to give K-State an 11-3 lead at the first media timeout. After the timeout, TCU found a spark of offense, including a 7-0 run that brought the score to 19-17 with 10:54 left in the first half. Over the next few minutes, the Horned Frogs kept the score close by out-rebounding the Wildcats, including a 18-15 margin in the first half. Despite the slight rebound advantage, K-State held the lead throughout the entirety of the half. The Wildcats sustained the lead throughout the first half, due in part to their strong defense. Throughout the first half, K-State forced 8 turnovers, resulting in 13 K-State points, as the Wildcats led 37-30 at the break. The second half started with an alley-oop from senior Barry Brown to junior Xavier Sneed, which gave K-State a 39-32 advantage just 1:03 into the half. Minutes later, the Wildcats connected on another alley-oop, this time from Stokes to Sneed, as K-State led at 43-32 with 17:24 left in the half. After TCU brought the score to within four with just under 12 minutes left, K-State scored four-straight points of their own to force a TCU timeout, including a second-chance dunk from Makol Mawien, to give K-State a 51-43 lead with 10:37 remaining. A pair of free throws from Sneed at the 6:16 mark of the second half gave the Wildcats their largest lead of the night at 12, as they led 56-44. The Wildcats shot 75 percent (18-of-24) from the line in the game. With the game winding down, TCU drew to within single-digits at 9 points behind a 3-pointer from J.D. Miller, as K-State led 62-53 with 2:15 remaining. K-State closed out the game by shooting 45.8 percent (22-of-48) from the floor, while holding TCU to shoot 42.6 percent (20-of-47). The K-State defense caused havoc for TCU, forcing 18 turnovers, opposed to the Wildcats’ 7. Xavier Sneed – Junior Xavier Sneed scored a season-high 18 points on Saturday, marking his 10th game this year and 45th career game in double figures. Sneed also led the team in scoring for the fourth time this season, as he paced three Wildcats in double figures. 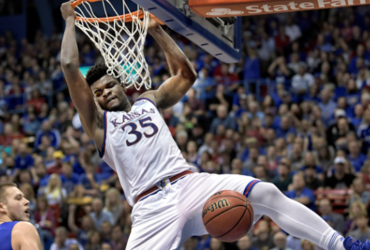 25.4 – The Wildcats held the Horned Frogs to 25 points under their season scoring average, as K-State held TCU to 55 points on 42.6 percent shooting, compared to its 80.4 points per game average entering Saturday’s contest. Defense has been a theme for the Wildcats, as they rank sixth in scoring defense in the NCAA, averaging 59.5 points per game entering Saturday’s game.